Summertime is in full swing in downtown Charleston. While everyone loves to shop on King Street or have a lunch picnic at Charleston Waterfront Park, we also enjoy indoor attractions and activities that keep us cool. Stay cool this summer with these top 5 activities—AC guaranteed! 1. South Carolina Aquarium- Tucked alongside the Charleston Harbor, The South Carolina Aquarium allows everyone to learn about marine life. The Aquarium features the local sea life as well the exotic reptiles and fish found outside our indigenous coastlines. Spend hours exploring every exhibit, from the Mountain Forest, Piedmont to Coastal plains and Saltmarsh Aviary. Stay to watch divers feed sharks in their two-story-385,000 gallon great ocean tank. Meet Charleston’s own 220-pound sea turtle named Caretta and learn more about more their Sea Turtle recovery and take a tour of Sea Turtle rehabilitation. Be sure to enjoy the view from the sundeck before you leave—snag a picture with the Ravenel Bridge as the backdrop! 2. Nathaniel Russell House- Take a trip back in time while visiting this historic site, a National Historic Landmark built in 1808. Docent-led tours take place every 30 minutes. 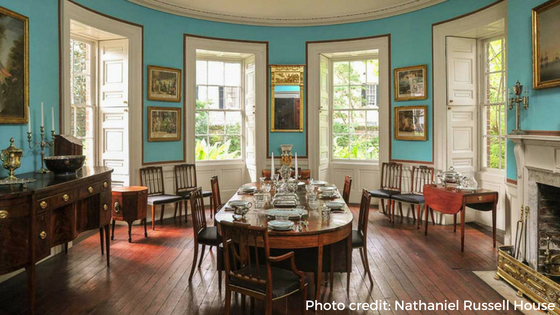 The tours offer a great second-hand recount of the life of Nathaniel Russell and the Charleston’s elite post-revolutionary war. Spend an hour marveling at the three-story free-flying staircase and stroll through the formal gardens. Learn about the history of one of Charleston richest Resident and the Africans that were enslaved on the property. The Nathaniel Russell House will be a great educational experience for all ages. 3. Lunch at Kitchen 208 – The best place to for a quick easy lunch, take a break at Kitchen 208. Their menu has something for everyone –this locally owned restaurant is located on King Street steps away from all the best attractions. Take a seat inside this fast-casual Charleston style restaurant or relax outside on their breezy dog-friendly covered patio and watch as the people go by. Kitchen 208 has daily specials made with fresh house-made ingredients and friendly staff that makes it’s a popular spot for locals in Charleston. 4. Children’s Museum of the Low country- Traveling with young children who have a extra energy? Head to the Children’s Museum of the Lowcountry. They will love this indoor playground that promotes imagination and curiosity through the power of play. This non-profit organization has nine different hands-on exhibits that are self-guided that allow children to be creative and parents to be engaged while in a controlled environment. Children can dress up as Princesses and Knights in a child size medieval castle, put on a smock explore water cycle and hydroelectric dams. You will spend hours moving from room to room—all while staying cool. 5. Pounce Cat Café – Calling all cat lovers! This locally owned Charleston Café was created for a cause. The Pounce Cat Café, located on Meeting Street is partnered with the Charleston Animal Society. Be sure to make an online reservation before visiting this cozy café. Cool off with the kitties and enjoy a cold beverage at the same time!